This review is written by my good friend Beth Rooney, who has a food photography blog here. You can find her photos anywhere from Saveur magazine to the New York Times- remember her name! You'll see it often in future years ;-) Here's a recipe link she made from this book reviewed below. And, without further ado, here's Beth! Madison (Vegetarian Cooking for Everyone) celebrates the seasonality of produce from farmers' markets across the country in this sophisticated cookbook. Sharing a few meat recipes, Madison has organized this collection by category (Corn and Beans, Stone Fruits, etc.) and included recipes mostly using vegetables and fruits. Not just another how-to for arranging tomatoes on a plate, the book presents such year-round recipes as Cabbage and Potato Gratin with Sage, or Corn and Squash Simmered in Coconut Milk with Thai Basil, alongside tributes to highlighted markets. Vegetarians will welcome main courses such as Braised Root Vegetables with Black Lentils and Red Wine Sauce or Asparagus and Wild Mushroom Bread Pudding. Recipes do demand close reading: one calls for a can of coconut milk but uses only part. However, shoppers learn how to use sunchokes (Sunchoke Bisque with Hazelnut Oil), Concord grapes (Concord Grape Tart) and even hickory nuts (Hickory Nut Torte with Espresso Cream). Madison's custom preparations suit farmer's market boutique style: she cuts each type [of squash] in the way that best preserves its form: lengthwise for the zucchini, crosswise for pattypans and round squash. Chefs will love the Herbs and Alliums chapter introducing Marjoram Pesto with Capers and Olives and Herb Dumplings for Soups and Ragouts. Also strong are composed salads, such as Avocado and Grapefruit Salad with Pomegranates and Pistachios, the eggs and cheese chapter and extensive fruits and desserts, such as Blood Orange Jelly and Greg's Huckleberry Pie. This is a book cooks will reach for to enliven repertoires. This book has recipes that range from simple and quick to complicated and involved. The beautiful thing is, no matter which end of the spectrum the recipes fall on, they will always impress. 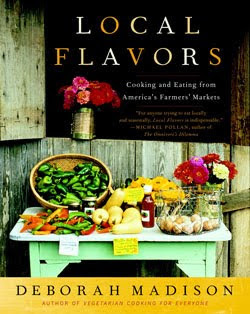 This book further confirms the idea that fresh ingredients make all the difference in the world when cooking. I love the way the book is organized by season because when the farmers’ markets begin in the spring I sometimes walk away disappointed that all the farmers have are some herbs and a few greens. This book made me realize this is a blessing not a curse, it allows you to slowly ramp up your cooking, in anticipation of the flood of produce in August and September when everything is caught up and all the herbs, veggies are all piled high in beautiful abundance at the markets, or in your own garden. Local Flavors also has interesting sidebars, farmer profiles, and seasonal menus. The only negatives I can see with this book is the somewhat heavy handed and slightly preachy introduction and that some recipes leave out a step or two. This can be remedied by: skipping the introduction if you find it to be too much and by looking up any questions you have online. These recipes will take the guesswork out of what to do with the fresh produce you come home with from the market or receive in you CSA box. But be sure to read the recipes completely before starting, you might miss something the first time through. After you’ve tried the recipes a couple times, it is easy to substitute one veggie for another. These are not fussy recipes with precise measurements and this makes this book realistic. The photos in this book are quite good as well. I sincerely hope you will buy or borrow this book soon. I know the peak market season will be passing shortly, but you can still cook seasonally in the winter. I think it is always wise to borrow cookbooks from the library or from a friend (if you can get them to let go of it for a few days) before buying because not everyone likes the same style of cooking. And it can be terribly disappointing to buy a recipe book and dream about all the delicious food you will make only to find you really hate French style cooking and now have a 400 page hard cover book that would do better as a door stop than a cookbook. So hit up the library and get this book! Then, go buy it. Great review! Some of these dishes sound amazing and mouthwatering. I am thinking about checking out some new cookbooks soon, as I am getting tired of fixing the same handful of meals all the time, and I want to introduce some variety. I will be checking out this book really soon. Thanks! You twisted my arm - I'm going to check for this at my library. I like that it is divided into seasons. I recently added a tab to my own cookbook that include Summer Dishes because I can only make them when my garden is producing. Wonderful review! I LOVE cookbooks and am a strict vegetarian so I I will give this one a try. Thanks for reading the review. Aarti sets a pretty high standard so I didn't know if her readers would like it...But it's hard to mess up a review on such a good book. And thanks for checking out the blog, I hope you all keep going back for the new posts!